It’s hard to write a drama — because it’s hard to write a drama with a plot, because a plot means that you have to at the end of the drama resolve that problem which gave rise to the drama in such a way that it’s both surprising and inevitable as per Aristotle. The thing is, can you turn the film around in the last 10 seconds — one of the hardest things in the world to do. I do not understand that discipline called “Ethnography,” which seems to me the validation of a prejudice by means of an excursion. One can no more understand the operation of other cultures from observation than can one so understand the sexual act. Observation, in the case of each, is missing the point, and Ethnography, or “Anthropology,” rests on a false assumption: that one may be free of prejudice. Hugh Hewitt interviewed David Mamet, the legendary playwright who has recently “come out” as a conservative, a couple weeks ago. They were discussing this book, Three War Stories. They concentrated on the first story of this collection, The Redwing, which Mamet described as a novella dually inspired by George MacDonald Fraser’s Flashman books and Patrick O’Brien’s seafaring novels. So naturally I had to buy it. This is one of those profound, densely packed works that probably ought to be read multiple times, and I’ve only read it once. But I enjoyed it, particularly the iconoclastic elements, which are many. I’m just not sure I entirely grasp the themes. The Redwing is a very complex story, ostensibly narrated by a former sailor, galley slave, and spy who later became the author of popular novels based on his own adventures. He does not tell his story directly, but as a series of commentaries on his books, with which he assumes the reader is already familiar. So we have to piece his real story together, in non-chronological fashion. Thus we’re dealing with a story on numerous levels – “factual” (though fictional) notes on a fictional work, based on supposedly factual events. This allows the author to play with the problems of the veteran who has a need to tell his story, but not all of it. He protects his country, first by risking his life, and then by concealing part of the truth from it. Notes on Plains Warfare is an examination (which I thought extremely apt) of the dynamics of a war in which one side had a strong moral case, superior tactics, and greater resolve, but was crushed by an opponent simply more numerous, technologically superior, and more pragmatic. It is presented in the form of another memoir, by an American army survivor. The last story, The Handle and the Hold, is a more matter-of-fact story, a little more linear than the other two, about two Jewish friends, a cop and a gangster, who join together to do a secret mission for Israel shortly after the end of World War II. Definitely worth reading, but more work than the fiction I usually review. Cautions for language and mature subject matter. Author David Mamet intends to self-publish his next work this year. He will be using a new service offered by his literary agency, ICM Partners, which will be using Argo Navis Author Services. With this service, Mamet has more options. The Times reports that self-published books were about a quarter percent of the bestselling books on Amazon in 2012. With the ICM Partners deal, Mamet’s book may published in ebook and print-on-demand paperback for 30% of sales. 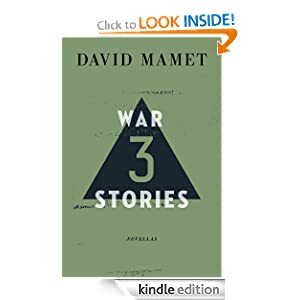 “All drama is about lies,” says David Mamet, and he goes on here. A very nice quote. Andrew Klavan reviews playwright David Mamet’s new book The Secret Knowledge: On the Dismantling of American Culture . 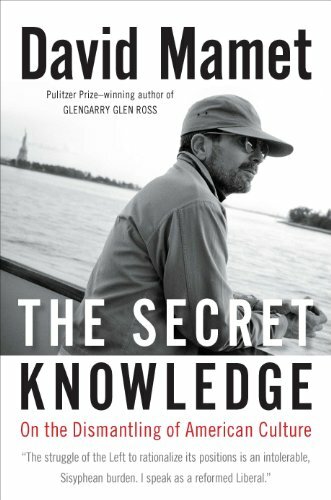 In fact, “The Secret Knowledge,” written in Mr. Mamet’s tough and funny style, is entertainingly informative. But the book only really becomes indispensable when it is personal and specific to Mr. Mamet’s experience. Andrew Ferguson has a powerful article on the political conversion of the strong playwright David Mamet. Of note is the fact that one of the books that blew his mind was Chamber’s Witness . “This book will change your life,” Jon Voight told him, and he was right. Mamet is stirring the pot on Broadway and in Hollywood with a new book of essays, The Secret Knowledge: On the Dismantling of American Culture. I’ll bet it’s worthy reading. David Mamet, “America’s most famous and successful playwright,” has rejected the political liberalism of his past, perhaps in an effort to avoid unpleasant New York cocktail parties. In the current Commentary magazine, Terry Teachout describes the playwright’s conversion as revealed in print.